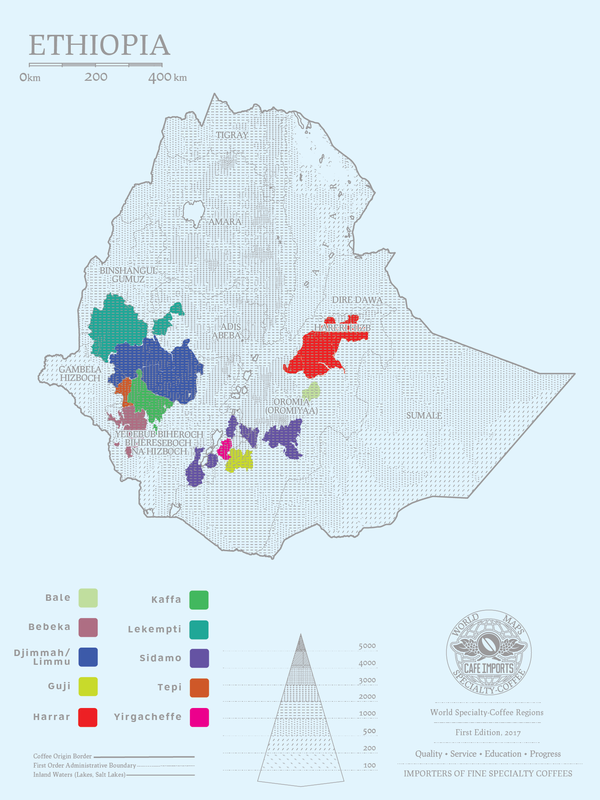 Check out our 2017 Origin Report on Ethiopia here. Harrar coffees are almost always processed naturally, or “dry,” and have a distinctly chocolate, nutty profile that reflects the somewhat more arid climate the coffee grows in. Sidama is a large coffee-growing region in the south, and includes Guji and the famous Yirgacheffe. Here is a very basic breakdown of what we look for in coffees from some of the microregions of Yirgacheffe, in the Sidama region. ADADO: Delicate stone fruit with citrus and floral layers that create a nice balanced structure. ARICHA: Complex and almost tropical, with a juicy fruit base and a sugary, floral sweetness. BERITI: Prominent florals backed by a creamy citrus. CHELCHELE: Cooked-sugar sweetness more like toffee or caramel, almond, and a floral, citrus overtone. KOCHERE: Fruit tea backed by citrus and stone fruit. KONGA: Peach and apricot—more floral stone fruit—along with a strong, tart citrus. ** About Ethiopian place names: There is much confusion and inconsistency where place names are concerned in Ethiopia, partially due to the fact that Amharic does not use a Roman alphabet like English does. Therefore, it is not necessarily incorrect to spell the region as Yirgacheffe, Yirgachefe, or even Yirga Chefe. We have chosen a company-wide set of standard spellings for clarity’s sake, but there are various ways of interpreting the phonetic spelling of certain places. As for Sidamo vs. Sidama, it has been brought to our attention that “Sidamo” is a somewhat disparaging variant on the place name, and we have decided to use the more acceptable Sidama instead. Jason Long, Café Imports’ CEO, has worked for many years to develop long-term partnerships in Ethiopia, and through our various relationships there, we are pleased to offer a variety of Ethiopian coffees every year. We buy directly from the second-tier co-operative society SCFCU (Sidama Coffee Farmers Cooperative Union), which allows us to bring Fair Trade– and organic-certified Sidama coffees from specific farmer co-ops to our customers. Through an export partner, we are also able to offer washing-station-specific lots, with limited traceability as purchased through the current ECX structure: In future years, the traceability of these lots should be increased, as we will be able to buy directly from the washing stations through our exporter. We also do offer some standard, less-expensive and less-traceable but still very good quality ECX lots, sourced for their quality and true-to-region profiles. As the industry waits to see how the marketplace will develop in the wake of the Exchange changes, we are committed to strengthening our relationships, specifically in Sidama and within Yirgacheffe, and hope that coming years will see more farmer-specific lots and special-prep projects with price premiums attached for quality and differentiation.